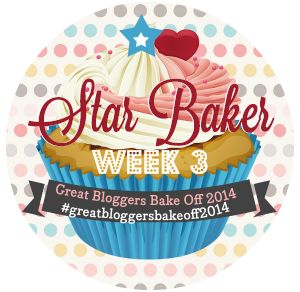 It's time for my final bake for the Great Bloggers Bake Off 2014. Jenny's instructions were to bake something a bit special using a bake that has been featured in this year's GBBO series. Now most people will play it sensibly and bake something that they have done before, or at least have an idea of how it is put together. 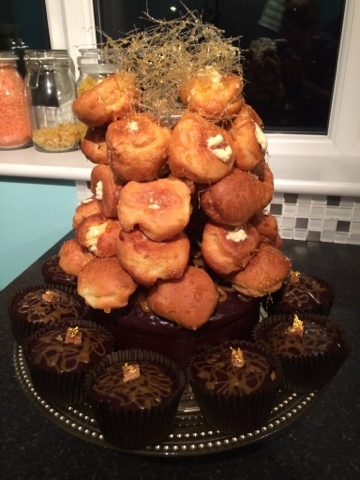 I baked everything in the morning, then filled the profiteroles and built the croquembouche just before heading to my sister-in-law's for our weekly Strictly viewing. The whole thing was assembled at her house, hence the slightly dark photos. Sadly my spun sugar started to quickly melt in the warm kichen, but the croquembouche held firm! Place the butter and sugar in a non stick pan over a low heat stiring until the butter melts and the sugar dissolves. Add the condensed milk and slowly bring to the boil, stirring continuously. As soon as the mixture thickens and smells of caramel, remove from the heat and allow to cool. Before starting to bake make a small cone using card to act as a mould for your croquembouche. Line this with baking parchment and fold the excess into the bottom of the cardboard cone. When it comes to removing the mould you will want to release the cardboard cone first then the baking parchment will easily come away from the croquembouch. You will find it easier to ask someone to gently hold the crochembouch while you remove the cone. Cream the butter & sugar together until light & fluffy. Beat in one egg at a time with a little flour to stop the mix splitting. Once all the eggs have been added fold in the remaining flour, vanilla paste & milk. Transfer two thirds into a greased 7" cake tin and the remaining third into muffin trays lined with cases, you will need about a tablespoon of batter in each case. Bake the cupcakes for 17-20 minutes and the cake for 50-60 minutes, or until a skewer inserted into the centre comes out clean. Do not open the oven for the first 15 minutes of baking, this will stop it collapsing. When baked cool the cupcakes on a cooling rack. Leave the main cake in it's tin for 5 minutes and then release and carefully place the cake onto another cooling rack with greaseproof paper underneath. Once all the cakes have cooled gently warm the apricot jam on a low heat until runny and brush onto the cake and cupcakes. Make your glaze and once cooled to 30C pour over the cake to cover completely. Carefully spoon the glaze over your cupcakes to cover the sponge but not run over the edge of the cases. Put some of your pre-made caramel sauce into a piping bag and pipe a swirly design onto the tops of your cakes. Add a small square of fudge to your cupcakes and gently place a piece of gold leaf onto the top of the fudge. You will need to use cocktail sticks for this. Do not use your fingers as the moisture will make the leaf stick to you rather than the cake! Sift the flour into a bowl and add the sugar, set aside. In a medium saucepan heat the butter and water over a moderate heat. As soon as the butter is melted and the mixture comes to the boil, turn off the heat. Tip in the flour and sugar and beat vigourously with a wooden spoon until you have a smooth ball of paste and the side of the saucepan are clean. This will probably take less than a minute. Gradually beat in the eggs a little at a time, until you have a smooth, glossy paste that slowly falls off the wooden spoon. Run your greased baking sheets under cold running water for a few seconds and tap to get rid of excess moisture. This will help your profiteroles to rise. Place teaspoons of choux pastry onto the trays, leaving a 1" gap. and bake on a high shelf for 10 minutes, after that increase the temperature to 220C and bake for 15-20 minutes until the buns are crisp and golden in colour. Peirce the side of each one to let out steam and return them to the oven for a few minutes and cool on a wire rack. You may need to bake these in batches. Place the icing sugar and cream in a bowl and whip until thick. Drizzle the caramel sauce onto the whipped cream and gently fold in. Just before you want to serve your croquembouche cut a small hole into the bottom of each profiterole. Put the whipped cream into a piping bag and pipe a small amount of cream into each one. Please treat the caramel carefully. Molten sugar is extremely hot and will give you a nasty burn if it gets on your skin (as my extremely sore finger now knows!). Do not let children help with this stage. If you are unsure, use melted chocolate instead of caramel to stick your croquembouche together. Gently heat 150g caster sugar in a small heavy non stick pan. Once the sugar begins to melt around the edges, gently stir using a metal spoon to allow all the sugar to melt. Keep it on the heat until the caramel is golden in colour and then remove from the heat. 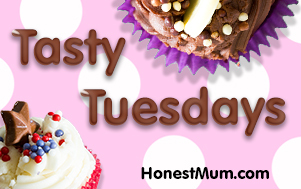 Carefully dip each profiterole into the caramel and place around your mould. If the caramel hardens too much place back on the heat to soften. 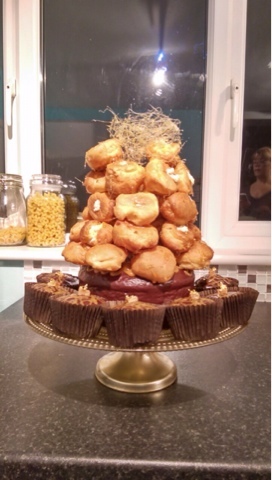 Once all your profiteroles are on the mould dip a fork into the remaining caramel and drizzle over the croquembouche. You could also make some spun sugar, using a greased wooden spoon to flick the sugar over. This video tutorial will give you a guide. Put your large cake onto a cake stand. Gently remove the mould from your croquembouche and place onto the cake. Top with spun sugar and add the cupcakes to the stand. And that's it...simple!! I've really enjoyed taking part in this bake along. It's been challenging but so much fun. Please pop over to Mummy Mishaps and Supergolden Bakes to see what everyone else is creating for this final week. That's hugely impressive and definitely a showstoping challenge! Bet it tasted fab too (I LOVE choux). Well done for getting it done so quickly after the final as well. 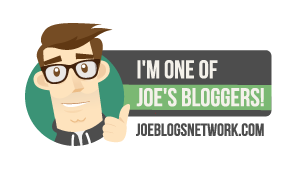 Thanks for linking to #GBBO Bake Along it's so inspiring to see what everyone has made. I love that! How cool. I would love to have a go at doing something like this one day...never quite find the right time though! Perhaps for Mr M's birthday this year? !